Perception is everything; especially in a web site. It is the public face of your club. A lot of the time it can mean the difference between a new parent signing their child up to your club, or looking elsewhere because it all just looks too hard. The set of tools that we've got for maintaining a web site are just so easy to use. So easy in fact, that we're not going to cover it in a heck of a lot of detail. If you're used to sending emails or writing documents on your computer, then you will have no trouble with maintaining your web site. This little guide will only cover things that you may not have seen before. Can't you just tell me......? Yep. We can. As a concept, we have not had one person who can't start building web site content in roughly 17.3 seconds. There are, however, a few little peculiarities that can occur, especially in our attempts to cater for the multiple types of browser and systems out there. We recommend having a quick look at what we've got in this document, but if you're just wanting an answer to a quick question or two, our Web Site Quickies will hopefully be able to give you that. 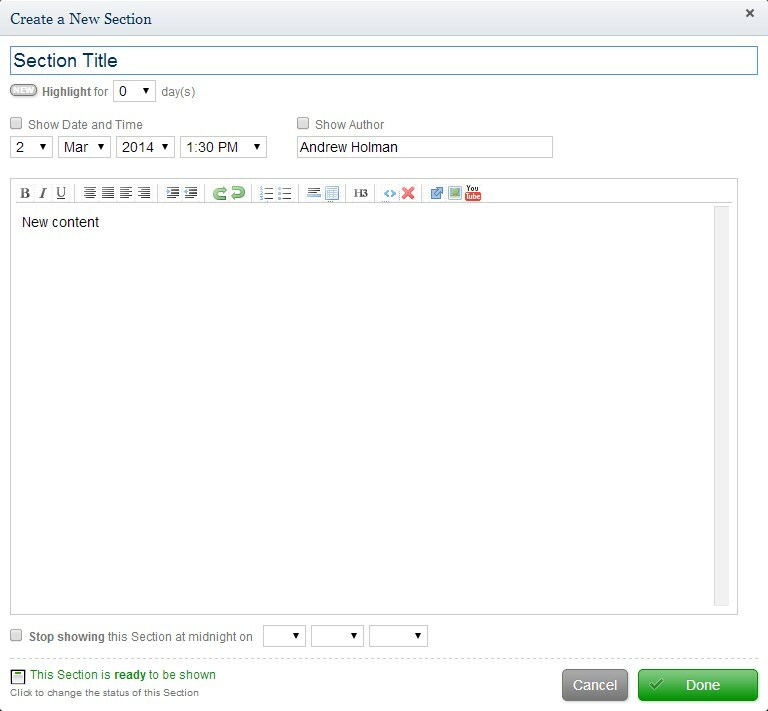 Creating and editing pages is very simple to do. You have two options to get started (you do need to be logged into the system and have Control Room access). Just visit any page on your web site (using the menu at the top that your visitors use). You will see a little link titled Edit this Page in the top right-hand corner of the page. Clicking that will put the page into edit mode. On the Content tab in the Control Room, locate either of the buttons indicated below. In the list of pages that appears, simply select the one that you want to edit, or + Add a Web Site Page to create a new one. Just about everything on here will be familiar to you. There are a couple of extra options available, plus some buttons on the toolbar that won't be familiar. Let's briefly cover them referring to a snapshot of our popup below. Starting from the top, the New highlight option can be set to a number of days. Our awesome CMS will automatically affix an attractive little graphic to the section to let the reader know that the section is fresh from the oven. Show Date and Time and Show Author are fairly self-explanatory. They will be published along with the section. Near the bottom, if this section is only relevant for a fixed period of time, then check the box and indicate a date and time in the future that the content should stop showing. And right at the bottom-left, the "light-switch" at the bottom will alternate between Draft and Published mode. If in Draft mode, the section will be available for editing, but will not be displayed to the public until the switch is flicked on. Now, with the toolbar, it should mostly be pretty familiar. We're not going to cover all of them; just a couple. - For people who have chops in editing HTML directly, you can click this icon to see the raw HTML source for the section and edit it directly. - Insert a link. The correct way to use this functionality is to select the text first that you want to show as a hyperlink and then click this button. You'll be given a popup screen with heaps of options as to where that link is going to take whomever clicks it. - Insert an image. Pretty straight-forward. When clicked, a popup will appear that will let you insert an image that has been uploaded to the web site. Alternatively, you'll be able to upload one from your PC. - The icon gives this one way. Insert your own video of a skateboarding cat to make your site easy on the eye.